The city of Boston has a long history of racial tension and social resistance, particularly in the neighborhood of Roxbury, a community widely known for massive riots in response to the assassination of Martin Luther King, Jr. in 1968. Malcolm X resided there for a portion of his life. In addition, Roxbury was one of the neighborhoods most impacted by the desegregation of Boston’s Public Schools and subsequent “bussing” efforts on the part of the local government, which they resisted strongly as well. As with so many neighborhoods located in major cities, this history continued long after the Civil Rights movement, well into the 80s and 90s, and has strong reverberations to this day. A huge part of the Roxbury community’s history, and more specifically that of the residents of the Dudley Triangle area, as well as the root of many of the issues people there face today, relate to waste and environmental justice. 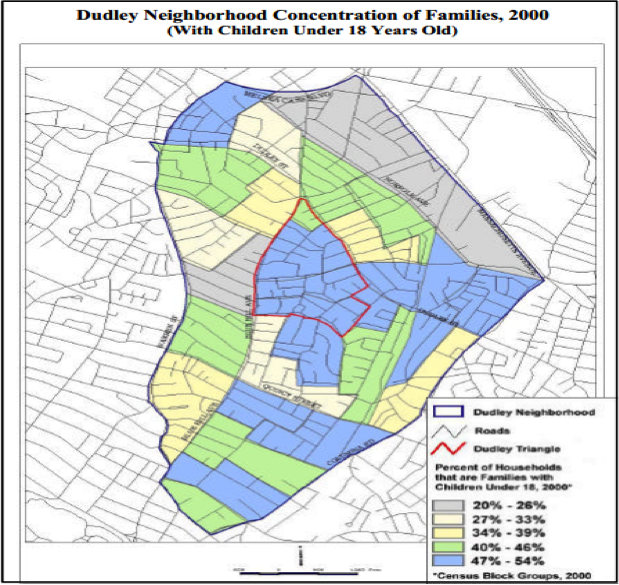 Investigating the history of the Dudley community reveals how its residents have been repeatedly put at risk since the end of WWII: from arson that left behind vacant lots with toxic soil to having those lots used for the illegal disposal of (sometimes also toxic) waste to air pollution that leads to higher rates of asthma among youth residents. But one can also discover the strength of this community and track the community-based actions that have led to great gains over time, even as the neighborhood continues to be disrespected in these many ways. This makes the Dudley Triangle a perfect case study not only of the ways in which communities are disenfranchised and abused, but of the ways in which such communities can rise up and take back control of their space and their health. Environmental Justice in Boston’s Dudley Neighborhood,” here in Word or pdf format.